Our low cost Series 668 Differential Pressure Transmitter is capable of measuring low pressures with a ±1% accuracy - ideally suited for proper building pressurization and air flow control. 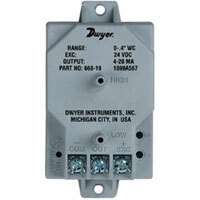 Transmitters can withstand up to 10 psig overpressure with no damage to the unit. Variable capacitance sensor design provides excellent sensitivity and long-term stability. Compact, lightweight design makes installation simple and easy. Units also feature reverse-polarity protection. Service: Air and non-conductive gases. Accuracy: ±1% of full scale (RSS), (includes non-linearity, hysteresis, and non-repeatability). Temperature Limits: Operating: 0 to 150°F (-18 to 65°C), Storage: -40 to 185°F (-40 to 85°C). Pressure Limits: 10 psig (0.7 kg/cm²). Compensated Temperature Range: 0 to 150°F (-18 to 65°C). Thermal Effects: 0.033% FS/°F (0.18% FS/°C). Zero and Span Adjustment: ±1 mA, non-interactive. Pressure Connection: 3/16" O.D. fitting for 1/4" I.D. tubing. Housing: Fire retardant glass filled polyester. Weight: 3 oz (85 g). 668-1 0 to 0.25 in. w.c.
668-2 0 to 0.5 in. w.c.
668-3 0 to 1 in. w.c.
668-4 0 to 2.5 in. w.c.
668-5 0 to 5.0 in. w.c.
668-6 0 to 10 in. w.c.
668-7 0 to 25 in. w.c.
668-8 0 to 50 in. w.c.
668-9 0 to 100 in. w.c.
668-10 0 to ± 0.1in. w.c.
668-11 0 to ± 0.25 in. w.c.
668-12 0 to ± 0.5 in. w.c.
668-13 0 to ± 1 in. w.c.
668-14 0 to ± 2.5 in. w.c.
668-15 0 to ± 5 in. w.c.
668-16 0 to ± 10 in. w.c.
668-17 0 to ± 25 in. w.c.
668-18 0 to ± 50 in. w.c.
668C-1 0 to 0.25 in. w.c.
668C-2 0 to 0.5 in. w.c.
668C-3 0 to 1 in. w.c.
668C-4 0 to 2.5 in. w.c.
668C-5 0 to 5.0 in. w.c.
668C-6 0 to 10 in. w.c.
668C-7 0 to 25 in. w.c.
668C-8 0 to 50 in. w.c.
668C-9 0 to 100 in. w.c.
668C-10 0 to ±0.1 in. w.c.
668C-12 0 to ±0.5 in. w.c.
668C-13 0 to ±1 in. w.c.
668C-14 0 to ±2.5 in. w.c.
668C-15 0 to ±5 in. w.c.
668C-16 0 to ±10 in. w.c.
668C-17 0 to ±25 in. w.c.
668C-18 0 to ±50 in w.c.